Our #1 Gift Basket! 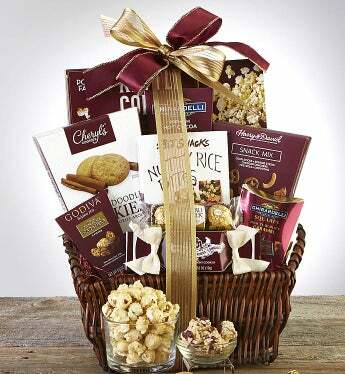 Send a friend this graceful, sumptuous gift basket made of fine, hand-woven burgundy stained natural willow. It’s brimming with an abundance of savories and sweets like rich and crisp Cheryl's Snickerdoodle Cookies, creamy Ghirardelli® Squares® Milk & Caramel Chocolates, decadent Godiva® Caramel Chocolates, lush Ferrero Rocher® Chocolates, velvety Ghirardelli® Double Chocolate Cocoa, zesty Harry & David® Super Party Snack Mix and more! Select the Deluxe, Grande, or Supreme basket. Accented with a magnificent hand-tied burgundy and gold ribbon. Our #1 Gift Basket! Send a friend this graceful, sumptuous gift basket made of fine, hand-woven burgundy stained natural willow. It’s brimming with an abundance of savories and sweets like rich and crisp Cheryl's Snickerdoodle Cookies, creamy Ghirardelli® Squares® Milk & Caramel Chocolates, decadent Godiva® Caramel Chocolates, lush Ferrero Rocher® Chocolates, velvety Ghirardelli® Double Chocolate Cocoa, zesty Harry & David® Super Party Snack Mix and more!